And now… the moment we’ve all been waiting for… Dirty Pictures is now available on DVD! If you’ve already seen the film, go to Amazon and write a review! 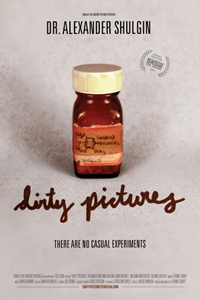 The award-winning Shulgin documentary, Dirty Pictures, will open San Francisco’s 10th annual DocFest on Friday, October 14. The San Francisco Documentary Festival is an annual festival devoted to documentary cinema. Dirty Pictures Fri Oct 14 – 7:15 PM: Roxie Theatre, 3117 16th St., S.F. Sat Oct 15 – 9:30 PM: Shattuck Cinemas, 2230 Shattuck Ave., Berkeley. Tues Oct 18 – 7:15 PM: Roxie Theatre, 3117 16th St., S.F. Friday Oct 14 screening followed by an Opening Night Party at CellSpace (2050 Bryant at 18th). Featuring Siamese Stereo, Placentaur, and DJ Violent Vickie. $6 or Free admission with your Dirty Pictures ticket stub. The party is 21up. From a lab in his California home, using himself and wife Ann as test subjects, Dr. Alexander “Sasha” Shulgin is on a quest: to unlock the complexities of the human mind…with psychedelic drugs. Targeted by some and revered by many, this genius “rogue chemist” has synthesized and researched over 200 compounds, including his most famous: MDMA. Great scenes, from cutting-edge neuroscience facilities to Burning Man, add to Sasha’s considerable star power, illustrating the many sides of our great drug debate.